Recent policy changes in California’s education system have opened up a unique opportunity to improve educational opportunities for the state’s 1.4 million English learner students (ELs). The implementation of new state standards including new English Language Development standards will require major changes in teaching and learning for all students including ELs, while the Local Control Funding Formula gives districts that educate large numbers of ELs additional resources to improve the services that they provide. To take full advantage of these opportunities policymakers and educators should rely on the best available evidence to shape state and district policies and to inform classroom instructional practice for EL students. 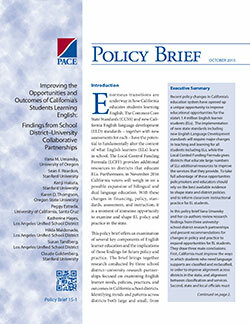 In this policy brief Ilana Umansky and her co-authors review research findings from three university school district research partnerships and present recommendations for changes in policy and practice to expand opportunities for EL students. They draw three main conclusions. First, California must improve the ways in which students who need language supports are classified and reclassified, in order to improve alignment across districts in the state, and alignment between classification and services. Second, state and local officials must become more systematic in how data on ELs are collected and used, by tracking students’ progress over longer time periods and by including all students who were ever ELs in accountability metrics. Finally, and most importantly, the state must improve ELs’ educational opportunities in school by expanding access to core content, bilingual instruction, and well-prepared teachers. Changes along these lines would not necessarily require large new investments, but they could yield substantial benefits for large numbers of California students.